“I lived there for a while, and I couldn’t stand it,” said our van driver cheerily as we entered Honiton’s red-brick estate area where, strangely, our hotel was to be found. He did. It’s unkind to even think it, because there sim­ply are two kinds of communities, cosmopolitan and di­verse, or not. Suspend judgement, I tell myself. The depths of Honiton feel distinctly urban, although the town, population 17,000, is prettily placed in the Devonshire countryside. And it feels jaded. I sense it was left behind by Maggie Thatcher’s 1980s’ “rising tide lifts all boats” and the several recessions since. “Oh, Honiton,” my aunt had said, and not another word on the matter, her tone suggesting all of the above. We walk the couple of kilometres into the town, all closed up for the night, except for the pubs. The thatched cottages fail to charm me in the dimming light. The men have ruddy, red faces; few people are out and about. Twenty-four hours later, my heart is full of Honiton, a bit rundown though it may be. Honiton lace, Honiton china and, unbelievably, Honiton hippo. Church, muse­um, library, railway station, thatched cottages including our 16th century hotel, the Heathfield Inn, part of which was a barn 200 years earlier. The Heathfield does a standard but delicious breakfast. The town’s library assistants all want to help us in our search for a local attraction, Combe Wood, although they have bare­ly heard of it. And the museum attendant is happy to chat about the traditional lacemaking, which has really taken our fancy, and New Zealand, which has really taken hers. Devonshire teas in the Lacemakers Café are served by a polite, smiling young woman I think might almost have stepped out of a 19th century novel. 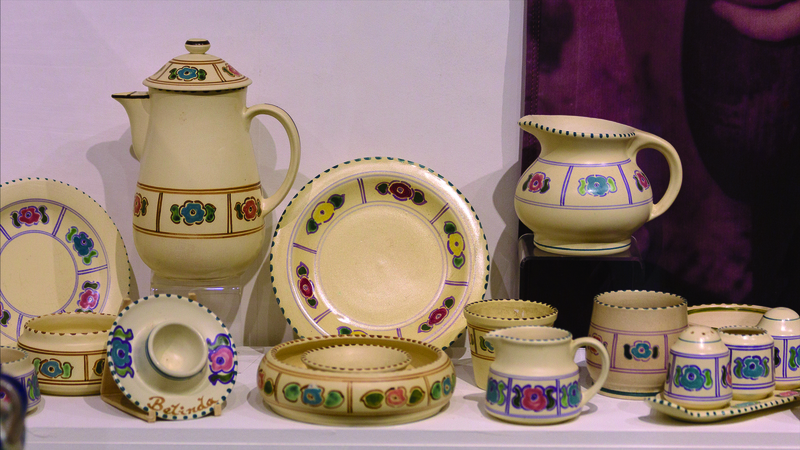 The contemporary Honiton lace and china aren’t com­pelling, but the works of the past are amazing in their craft and artistry. The finest Honiton lace, I later tell anyone who will care to listen, took 10 hours’ work per square inch. “Instagrammable” dresses and shawls, made by whirling slender threads around small wooden spindles by hand, from dawn till dusk. The craft evolved from 1620 into the machine-made era. We buy a tea towel each. Honiton china, with its rich, creamy background col­our and various painted floral and geometric patterns, is refreshingly bold, with hints of naïve art – but more sophisticated. As for the hippo, we first made its acquaintance on our walk down the lane to the wood. A cheery hippo stood out in blue paint on the signage for the primary school. Happy hippo seemed to be the idea, and it felt quaint to import an African water beast as your mascot. However, they hadn’t, it was their own, and they call him Bones. Hippos sludged along in England’s green and pleasant waters 140,000 years ago, and the museum displays a lo­cally excavated skeleton to prove it. Pleasant is, to us, an understatement for Combe Wood in the springtime. 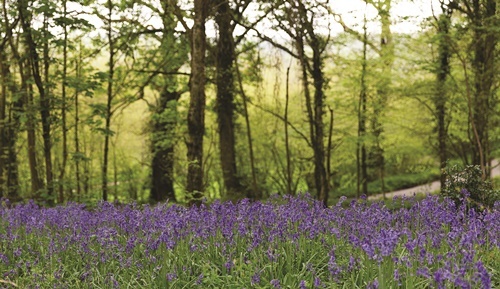 Take the short circular walk and allow the carpet of bluebells beneath oak and hazel trees to soothingly lodge in the memory. Although taxied from hotel to railway station, we were glad to be on foot and rail, far from the maddening motorways. 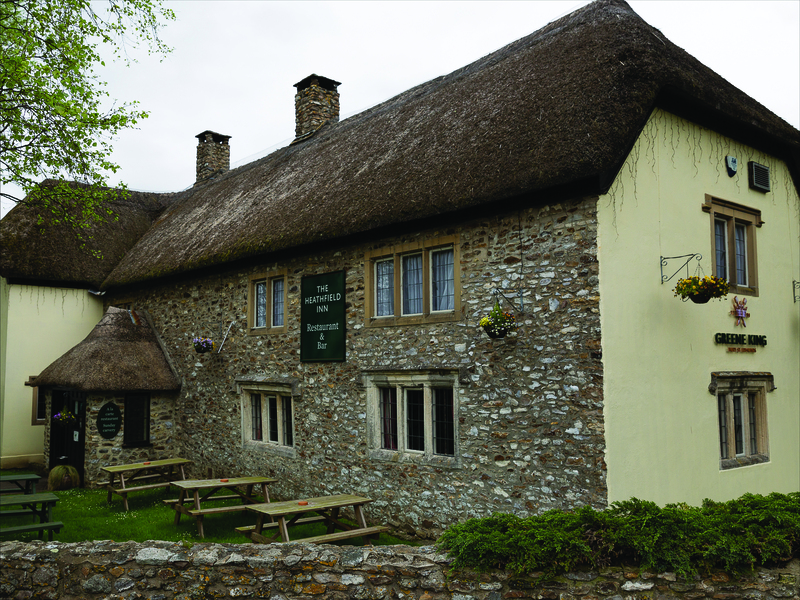 The day before, happily reunited with relatives, we had been taken around on quieter roads in a four-wheel drive, from Axminster to Lyme Regis, on another quintessen­tial English day out. There was a bit of East Devon with more-than-usual­ly glorious hills rolling down to the sea. There was also the Axminister Hugh Fearnley-Whittingstall café lunch; I chose super healthy with quinoa and slightly regretted it – but still, yum, and it’s a name-drop. At Lyme Regis, a waterfront walk and ice creams (one lost to a thieving seagull), the view of Dorset’s Jurassic Coast (home to TV’s Broadchurch – not that I’m a fan) and ammonite fossils. And then – oh, Honiton.